The long-rumored iPad Mini could be unveiled as soon as Sept. 12, though some sources have speculated that Apple would be smarter to choose an October launch. Either way, it's not surprising that third-party iPad Mini accessories have begun springing up from overseas. What is surprising is what they reveal about the iPad Mini's features. Would you like a mic with your camera? A batch of iPad Mini cases appeared online at Giz-China, and they reveal that the iPad Mini will come packing a rear-facing camera - no surprise there. However, more curious is a mysterious orifice located at the top center on the back of the pictured iPad Mini cases. That hole would serve no purpose on the existing iPads, so naturally it's the source of some speculation. The most likely theory seems to be that the strange hole could be there to leave room for a rear-facing microphone, which could improve the sound quality of videos recorded with the iPad Mini's camera. iPad Mini and iPhone 5 - two of a kind? What's even more curious is the link that these alleged iPad Mini cases draw between the smaller iPad and Apple's next iPhone - be it the iPhone 5 or whatever. In May, images that purported to show the iPhone 5's backplate appeared online, and they too showed a mysterious hole. The iPhone 5's extra orifice rests not in the top center, but at the top left, nestled between the smartphone's camera and LED flash. At the time, speculation pointed to a second microphone, a theory that the new iPad Mini case images support. 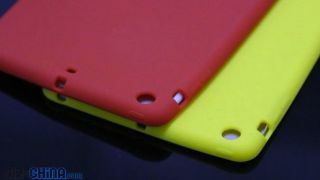 Both the leaked iPhone 5 backplate images from May and the more recent iPad Mini case photos indicate that Apple's new devices will indeed feature the rumored smaller dock connector. The smaller dock connector (with 8 pins, versus the current jack's 30) could be used in every new Apple device, if rumors from earlier in August are accurate. In the iPhone 5 leak, the small dock connector appears to be situated on the bottom of the device, though the iPad Mini cases show it resting on top, directly above that mysterious hole. No matter what, it's doubtful that a new dock connector and second microphone will be the most exciting revelations once the iPad Mini is finally revealed.